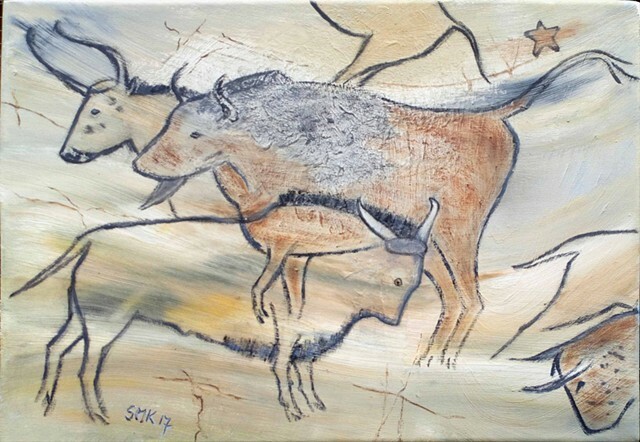 After I had finished painting pastiches based on the French caves at Chauvet I had enjoyed the process so much using mixed media that I thought I would try to achieve something similar using only oils. This is 'my' tribute to the bulls of Spain. The original paintings stretch around the bulge of a rock or the downward outward sweep of the rock face. They may look simple but I find them sophisticated, especially when portraying a chase/hunt. Often the animals are painted on top of each other giving a multi layered multi action view. Wonderful . Postcards A6 with or without envelope, please see order form.